Seatorque Control Systems LLC is an innovative force in the marine manufacturing industry with an award winning fully enclosed fixed shaft drive system. The Seatorque Control Systems BOSS is a totally enclosed, oil filled, self contained, shaft and thrust bearing assembly, supplied as a complete unit from transmission output coupling to propeller end. Based on over 14 years of research and development, and covered by numerous Patent applications, the BOSS delivers. Driveline noise and vibrations are eliminated by rubber mounting the system to the vessel. Thrust is delivered to the hull structure not the engine, and noise is contained, not transmitted. With no horse power restrictions, the BOSS is available in ratings up to 3000 HP per shaft. By eliminating the rotational aspect of a traditional shaft, only passive drag remains producing very little in the way of robbed horse power. Reduced turbulence through the propeller due to the non rotating shaft casing, plus eliminating cutlass bearings and stuffing boxes allows for an average* of 8% extra delivered Horse Power to the propeller. 3000-Hour, or three-year extended maintenance cycle, only involving changing the shaft oil. No reliance on complex electronic control systems. 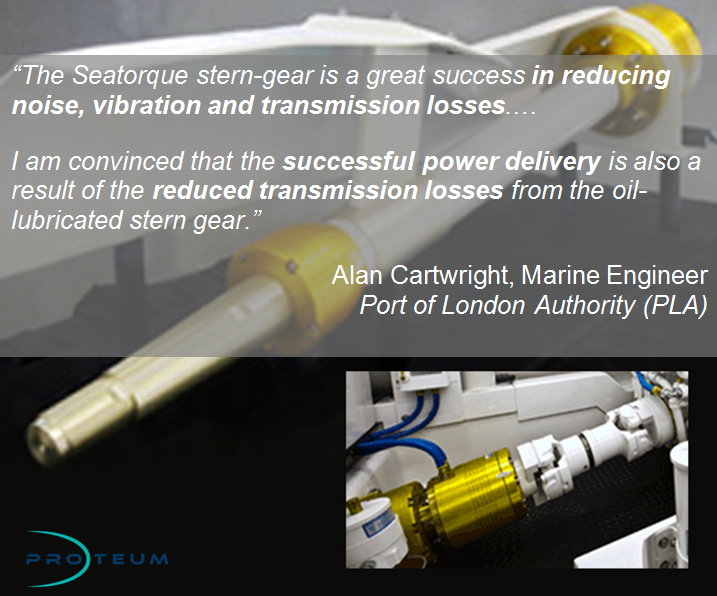 Proteum is the official UK & Ireland Distributor for Seatorque Control Systems. We work with a range of clients which include boat builders, designers, operators and owners. Proteum offers a one-stop-shop for new engine sales, spare parts and servicing.